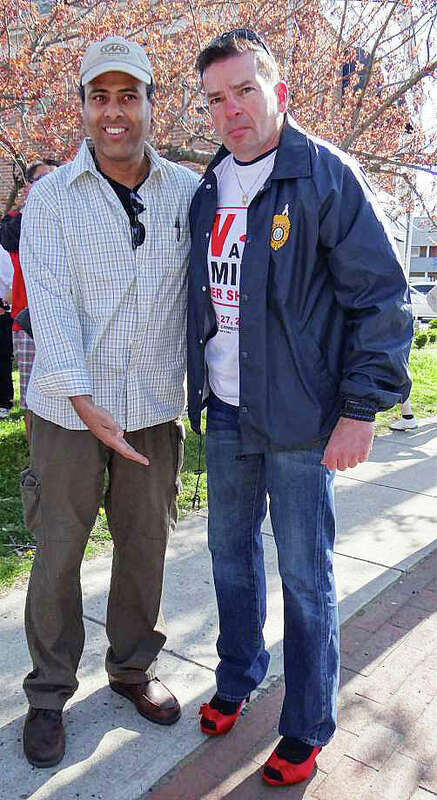 “Walk a Mile in Her Shoes,” led once again by Police Chief Gary MacNamara striding down the Post Road in bright-red stiletto heels, takes place Saturday to benefit the Center for Family Justice. The fundraising walk begins at 9 a.m. on the Post Road, near the Starbucks at the intersection with Mill Plain Road, and proceeds to Town Hall Green on the Old Post Road. Registration gets underway ay 8:30 a.m. It is planned rain or shine. The Center for Family Justice sponsors the walk to raise money for its programs to aid victims of domestic abuse, and to promote awareness about the cause during Sexual Assault Awareness Month. Joining MacNamara will be state and local government officials, leaders of community organizations and teams representing high schools, colleges, businesses and civic groups. The annual Dogwood Festival takes place May 6-8 on the grounds of the Greenfield Hill Congregational Church, 1045 Old Academy Road. Vineyard Vines this year has created a collection of customized tote bags and ties with dogwood blossom motifs in tribute to the festival’s heritage. They can be ordered in advance online at reduced prices: $85 for the ties ($95 at the festival) and $95 for the tote ($105 at the festival). Get an order form at http://bit.ly/1VJWkzu. The three-day festival’s features include: a Friday luncheon with a performance by the Ekklesia Contemporary Ballet Company; the Dogwood Dash 2-mile run and Dogwood Mini-Dash on Saturday; musical performances; art displays; antiques sales, and more than 50 crafts, artisan and food booths, with vendors from throughout New England. Proceeds from the Dogwood Festival go toward local, national and international charities that support families and at-risk children, address homelessness and aid other altruistic endeavors, according to festival organizers. Dogwood Festival at Greenfield Hill Congregational Church — Friday, May 6, and Saturday, May 7, from 10 a.m. to 5 p.m.; Sunday, May 8, from noon to 5 p.m. Admission is free. For details, visit www.greenfieldhillchurch.com. A “Magic of May” benefit for the Visiting Nurse & Hospice of Fairfield County agency will be hosted Sunday at a home in the Southport section of town. The event will take place from 4:30 to 7:30 p.m. in the Sasco Hill Road home of Liz Fox, a supporter of the nonprofit home health care and hospice agency. Proceeds will benefit patients in need, according to event planners. In addition to cocktails and hors d’oeuvres, the event will feature silent auctions, magician Bill Herz and music performed by Chris Coogan. Auction offerings include tickets to the Broadway musical, “Hamilton”; a week’s stay in a home on Kiawah Island; four field-level tickets to a Mets game; tickets to the “Tonight Show”; tickets to a Yankees/Red Sox game at Fenway Park, and a week at the Grand Mayan resort. For tickets or more information about the Magic of May benefit, call Visiting Nurse & Hospice of Fairfield County at 203-834-6341, ext. 305, or register at www.visitingnurse.net. Daniel Parrott, a 1979 graduate of Roger Ludlowe High School, now a professor at Maine Maritime Academy in Castine, Maine, has received a Fulbright U.S. Scholar Grant to work at the University of Costa Rica’s new School of Nautical Engineering and Maritime Transport in Limón, Costa Rica. Parrott’s scholarship project there will be from February to June 2017. Parrott teaches navigation, seamanship and bridge resource management at Maine Maritime Academy. He holds a B.A. from Colby College and M.A. from the University of Rhode Island.